Abstract. Late Pleistocene sea level has been reconstructed from ocean sediment core data using a wide variety of proxies and models. However, the accuracy of individual reconstructions is limited by measurement error, local variations in salinity and temperature, and assumptions particular to each technique. 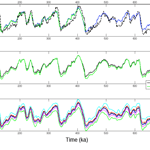 Here we present a sea level stack (average) which increases the signal-to-noise ratio of individual reconstructions. Specifically, we perform principal component analysis (PCA) on seven records from 0 to 430ka and five records from 0 to 798ka. The first principal component, which we use as the stack, describes ∼ 80% of the variance in the data and is similar using either five or seven records. After scaling the stack based on Holocene and Last Glacial Maximum (LGM) sea level estimates, the stack agrees to within 5m with isostatically adjusted coral sea level estimates for Marine Isotope Stages 5e and 11 (125 and 400ka, respectively). Bootstrapping and random sampling yield mean uncertainty estimates of 9–12m (1σ) for the scaled stack. Sea level change accounts for about 45% of the total orbital-band variance in benthic δ18O, compared to a 65% contribution during the LGM-to-Holocene transition. Additionally, the second and third principal components of our analyses reflect differences between proxy records associated with spatial variations in the δ18O of seawater. How to cite: Spratt, R. M. and Lisiecki, L. E.: A Late Pleistocene sea level stack, Clim. Past, 12, 1079-1092, https://doi.org/10.5194/cp-12-1079-2016, 2016. 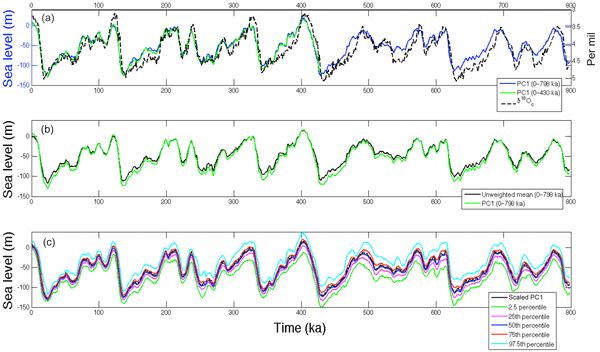 This study presents an average of seven Late Pleistocene sea level records, which improves the signal-to-noise ratio for estimates of sea level change during glacial cycles of the past 800 000 years.